Lighthorse Technologies Inc announced today the release of its microminiature IPX connector and cable assemblies. The micro-miniature IPX connector is 100% form, fit, and function compatible with all U.FL Hirose series connector interfaces. The IPX connector's growing popularity lies in its extremely small size, making it ideal for a variety of space critical applications. 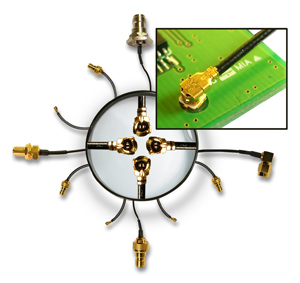 Operating up to 6GHz, the low profile (2.5mm) IPX connector has a 3mm square PCB footprint. IPX connector cable assemblies can be cut to any length and attached to a variety of RF connectors. LTI operates onsite semi-automatic IPX termination equipment to facilitate quick turn cable assemblies. Typical applications of the IPX connector include a variety of wireless technology systems such as GPS, wireless routers, Bluetooth, MIMO, RFID,WiMAX, iBurst, UWB, and Zigbee. With production in San Diego, CA, adjacent to what has been referred to as "telecom valley", LTI remains poised to offer quick turn cable assemblies to meet any specification required by a demanding and rapidly growing global wireless revolution.